Tuesdays I’ve dubbed 10k Tuesdays since that’s the longest distance my running group goes on that day. I’ve been practicing my 10k pace with this and it’s been fun seeing my time improve. I’m actually pretty pleased as I’ve been seeing mid 8s pretty consistently; I’d love to see that in some of my longer runs. Anyway, yesterday was just like any other. I was home all day with my two little ones and we waited (im)patiently for dad to get home. My phone jingled an alert and I went to check only to see that it wasn’t a regular text message but a weather advisory–a wind storm was approaching. 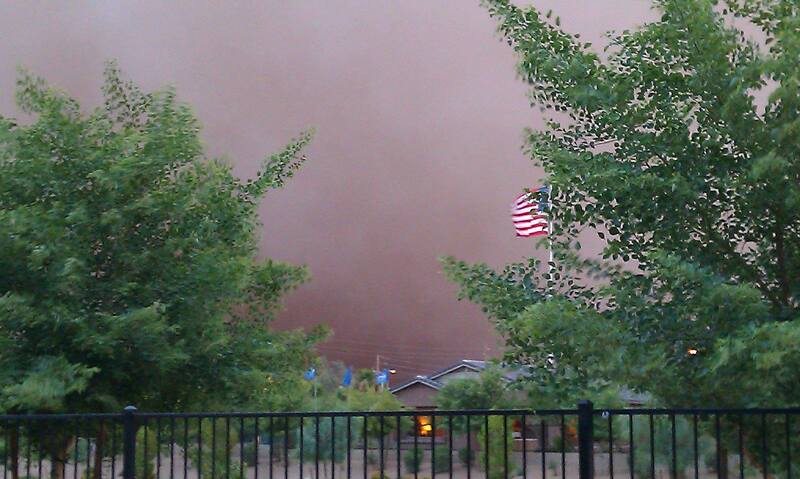 We get these haboobs, or massive wind storms, right around monsoon season which typically starts around June so to see this in late March was a bit of a surprise. But there it was as I opened the curtains and looked out. I decided I’d still go for my run. If no one from my group was there then I’d take it indoors on the treadmill. I was getting in my 6.2 someway, somehow. It was a small group but we were there and we were ready. I warmed up the first mile and was hoping for negative splits miles 2-5 with a cool down the last 1.2. Miles 2 and 3 were going great and then it was the turn around. Helloooo wind. Mile 4 was slower than I would’ve liked but still in a range that pleased me. I decided I’d make mile 5 a good one and picked up the pace. Now I’ve ran this route a billion times to the point where I can pretty much tell when I reach each mile. In my head, I knew mile 5 was getting closer so I was just waiting for the beep. Any beep now. Beep? Beep, where are you? The beep never came and when I knew for certain I had passed the 5 mile mark I looked down at my watch to see what the heck was going on. 4.99 miles. I kept running and looking at my watch waiting for it to beep. I finally clicked to the next screen and then the next and I could see the time passing but no beep and no mile 5. After clicking away a few times, my watch finally got it together and mile 5 sounded off. 14:10. Ummm…..I hadn’t stopped, slowed down, or paused my watch. 14:10?? 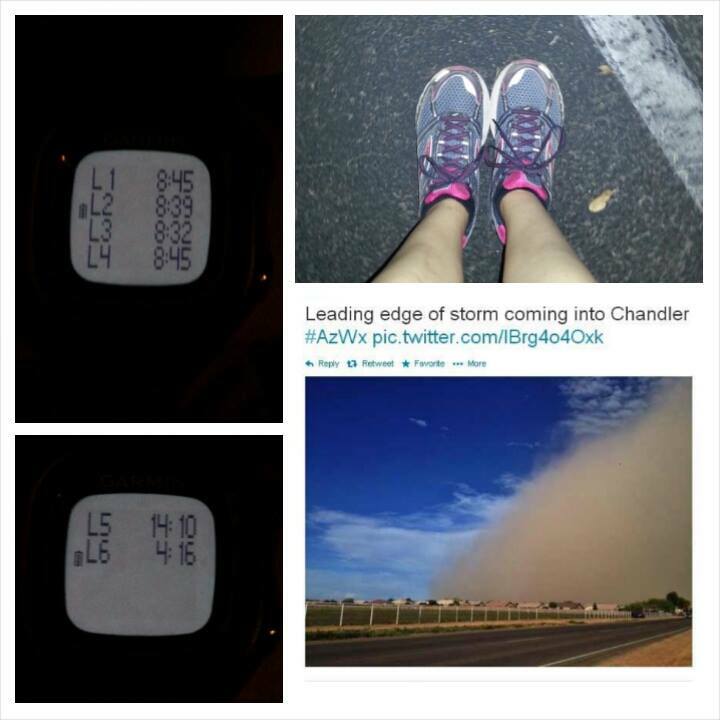 I figured the haboob must’ve screwed GPS and I finished my run frustrated at not having an accurate time. Oh technology. 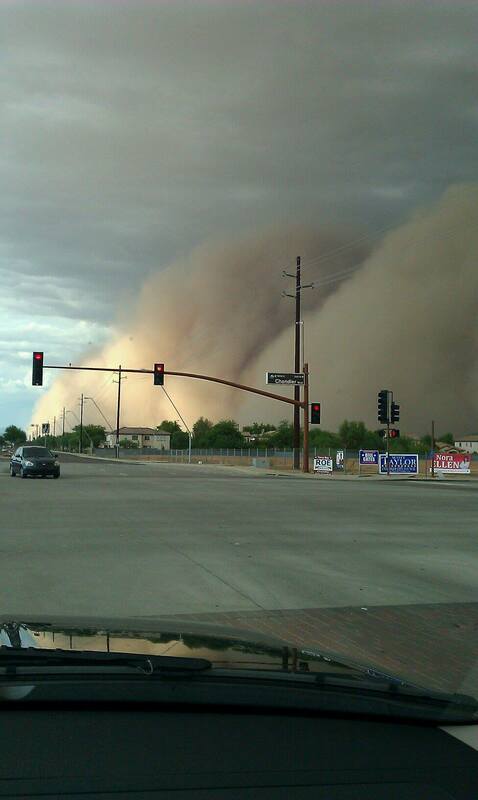 When I got home, I saw on the news that the haboob had actually been pretty intense. I missed it when it was full throttle (luckily) so I hadn’t seen it during my run but on picture it looked pretty cool. –Has your watch (or technology) ever gone wonky during a run? Yesterday I wrote about how I wasn’t sure what I was training for–RnR Madrid 1/2 Marathon or Grand Canyon Rim 2 Rim 2 Rim. Well, I seemed to have forgotten that I’ve got a 5k on Saturday lol! I have not done any speed work for quite some time now and am not sure I’m ready for a speedy 5k. They’re not particularly my favorite because I feel like it requires full on beast mode the entire way. I’m more of a leisurely long distance runner jaja! I’d love to finally get my sub 25:00 but I don’t foresee that happening with this race. In other news, we have a winner!! 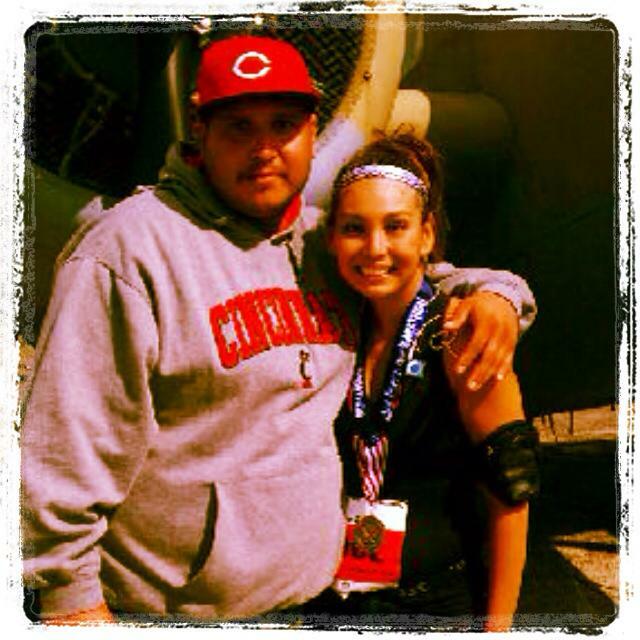 The ENERGYbits giveaway goes to…..
Yay Jolene!!! I’ll be e-mailing you to get some important info. –Do your siblings run or anyone else in your family? –Are you a 5k fan? I feel good with my mileage for last week. It was my first longish run/long hike back to back days Saturday and Sunday but I didn’t feel too exhausted afterward. 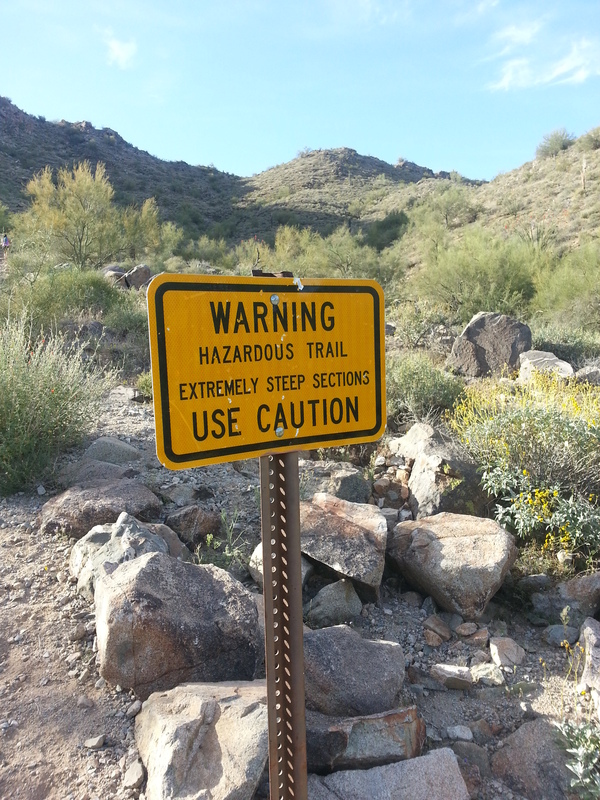 That’s something that’ll be regular leading up to the Canyon. I have a few things coming up so I’m in a weird not-sure-what-I’m-training-for place. I have RnR Madrid 1/2 Marathon next month (4/27) and the Grand Canyon Rim 2 Rim 2 Rim mid-May. I’m not working on PRing in Spain. I want to just enjoy the run and enjoy where I’m at. I do want to make sure I’m prepared for the mileage however. My longest run since my marathon March 1st was Sunday’s 10.6 mile run/hike. With me going out of town on Wednesday and not getting in a long run until about two weeks from now (plus I want to leave a few days for taper), I’m in a tight spot to make sure I can get it all in. But, I know that all the training I did for my marathon has left me with a good base and I’m not starting from scratch. What I am concerned with is that I get back from Europe May 3 and have my running group’s mandatory Death March 17.8 mile run/hike the next morning. With jet lag and the exhaustion from being gone a week, I think I’ll a good representative of that hike’s title. The hike includes the one I did on Sunday, looping around and going up the steep part an additional two more times (3x total). Sound fun, right? I love challenges so I’m excited about doing it but I’m not excited about doing it sleep deprived. This will be interesting. –Have you ever trained for two things at once?